In earlier chapters, variables have been explained as locations in the computer's memory which can be accessed by their identifier (their name). This way, the program does not need to care about the physical address of the data in memory; it simply uses the identifier whenever it needs to refer to the variable. For a C++ program, the memory of a computer is like a succession of memory cells, each one byte in size, and each with a unique address. These single-byte memory cells are ordered in a way that allows data representations larger than one byte to occupy memory cells that have consecutive addresses. 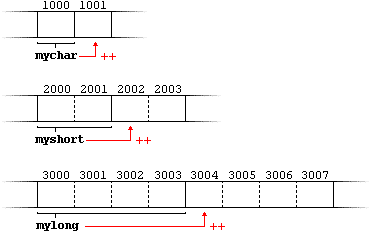 This way, each cell can be easily located in the memory by means of its unique address. For example, the memory cell with the address 1776 always follows immediately after the cell with address 1775 and precedes the one with 1777, and is exactly one thousand cells after 776 and exactly one thousand cells before 2776. When a variable is declared, the memory needed to store its value is assigned a specific location in memory (its memory address). Generally, C++ programs do not actively decide the exact memory addresses where its variables are stored. Fortunately, that task is left to the environment where the program is run - generally, an operating system that decides the particular memory locations on runtime. However, it may be useful for a program to be able to obtain the address of a variable during runtime in order to access data cells that are at a certain position relative to it. This would assign the address of variable myvar to foo; by preceding the name of the variable myvar with the address-of operator (&), we are no longer assigning the content of the variable itself to foo, but its address. The actual address of a variable in memory cannot be known before runtime, but let's assume, in order to help clarify some concepts, that myvar is placed during runtime in the memory address 1776. First, we have assigned the value 25 to myvar (a variable whose address in memory we assumed to be 1776). The second statement assigns foo the address of myvar, which we have assumed to be 1776. Finally, the third statement, assigns the value contained in myvar to bar. This is a standard assignment operation, as already done many times in earlier chapters. The main difference between the second and third statements is the appearance of the address-of operator (&). The variable that stores the address of another variable (like foo in the previous example) is what in C++ is called a pointer. Pointers are a very powerful feature of the language that has many uses in lower level programming. A bit later, we will see how to declare and use pointers. As just seen, a variable which stores the address of another variable is called a pointer. Pointers are said to "point to" the variable whose address they store. An interesting property of pointers is that they can be used to access the variable they point to directly. This is done by preceding the pointer name with the dereference operator (*). The operator itself can be read as "value pointed to by". This could be read as: "baz equal to value pointed to by foo", and the statement would actually assign the value 25 to baz, since foo is 1776, and the value pointed to by 1776 (following the example above) would be 25. & is the address-of operator, and can be read simply as "address of"
* is the dereference operator, and can be read as "value pointed to by"
Thus, they have sort of opposite meanings: An address obtained with & can be dereferenced with *. The first expression is quite clear, considering that the assignment operation performed on myvar was myvar=25. The second one uses the address-of operator (&), which returns the address of myvar, which we assumed it to have a value of 1776. The third one is somewhat obvious, since the second expression was true and the assignment operation performed on foo was foo=&myvar. The fourth expression uses the dereference operator (*) that can be read as "value pointed to by", and the value pointed to by foo is indeed 25. Due to the ability of a pointer to directly refer to the value that it points to, a pointer has different properties when it points to a char than when it points to an int or a float. Once dereferenced, the type needs to be known. And for that, the declaration of a pointer needs to include the data type the pointer is going to point to. These are three declarations of pointers. Each one is intended to point to a different data type, but, in fact, all of them are pointers and all of them are likely going to occupy the same amount of space in memory (the size in memory of a pointer depends on the platform where the program runs). Nevertheless, the data to which they point to do not occupy the same amount of space nor are of the same type: the first one points to an int, the second one to a char, and the last one to a double. Therefore, although these three example variables are all of them pointers, they actually have different types: int*, char*, and double* respectively, depending on the type they point to. Note that the asterisk (*) used when declaring a pointer only means that it is a pointer (it is part of its type compound specifier), and should not be confused with the dereference operator seen a bit earlier, but which is also written with an asterisk (*). They are simply two different things represented with the same sign. First, mypointer is assigned the address of firstvalue using the address-of operator (&). Then, the value pointed to by mypointer is assigned a value of 10. Because, at this moment, mypointer is pointing to the memory location of firstvalue, this in fact modifies the value of firstvalue. In order to demonstrate that a pointer may point to different variables during its lifetime in a program, the example repeats the process with secondvalue and that same pointer, mypointer. Each assignment operation includes a comment on how each line could be read: i.e., replacing ampersands (&) by "address of", and asterisks (*) by "value pointed to by". Notice that there are expressions with pointers p1 and p2, both with and without the dereference operator (*). The meaning of an expression using the dereference operator (*) is very different from one that does not. When this operator precedes the pointer name, the expression refers to the value being pointed, while when a pointer name appears without this operator, it refers to the value of the pointer itself (i.e., the address of what the pointer is pointing to). p1 would indeed be of type int*, but p2 would be of type int. Spaces do not matter at all for this purpose. But anyway, simply remembering to put one asterisk per pointer is enough for most pointer users interested in declaring multiple pointers per statement. Or even better: use a different statement for each variable. Pointers and arrays support the same set of operations, with the same meaning for both. The main difference being that pointers can be assigned new addresses, while arrays cannot. These two expressions are equivalent and valid, not only if a is a pointer, but also if a is an array. Remember that if an array, its name can be used just like a pointer to its first element. Which anyway would not make much sense (and is not valid code). The asterisk (*) in the pointer declaration (line 2) only indicates that it is a pointer, it is not the dereference operator (as in line 3). Both things just happen to use the same sign: *. As always, spaces are not relevant, and never change the meaning of an expression. To conduct arithmetical operations on pointers is a little different than to conduct them on regular integer types. To begin with, only addition and subtraction operations are allowed; the others make no sense in the world of pointers. But both addition and subtraction have a slightly different behavior with pointers, according to the size of the data type to which they point. When fundamental data types were introduced, we saw that types have different sizes. For example: char always has a size of 1 byte, short is generally larger than that, and int and long are even larger; the exact size of these being dependent on the system. For example, let's imagine that in a given system, char takes 1 byte, short takes 2 bytes, and long takes 4.
and that we know that they point to the memory locations 1000, 2000, and 3000, respectively. mychar, as one would expect, would contain the value 1001. But not so obviously, myshort would contain the value 2002, and mylong would contain 3004, even though they have each been incremented only once. The reason is that, when adding one to a pointer, the pointer is made to point to the following element of the same type, and, therefore, the size in bytes of the type it points to is added to the pointer. is equivalent to *(p++). And what it does is to increase the value of p (so it now points to the next element), but because ++ is used as postfix, the whole expression is evaluated as the value pointed originally by the pointer (the address it pointed to before being incremented). Like always, parentheses reduce confusion by adding legibility to expressions. Here p points to a variable, but points to it in a const-qualified manner, meaning that it can read the value pointed, but it cannot modify it. Note also, that the expression &y is of type int*, but this is assigned to a pointer of type const int*. This is allowed: a pointer to non-const can be implicitly converted to a pointer to const. But not the other way around! As a safety feature, pointers to const are not implicitly convertible to pointers to non-const. Note that print_all uses pointers that point to constant elements. These pointers point to constant content they cannot modify, but they are not constant themselves: i.e., the pointers can still be incremented or assigned different addresses, although they cannot modify the content they point to. The syntax with const and pointers is definitely tricky, and recognizing the cases that best suit each use tends to require some experience. In any case, it is important to get constness with pointers (and references) right sooner rather than later, but you should not worry too much about grasping everything if this is the first time you are exposed to the mix of const and pointers. More use cases will show up in coming chapters. As with the spaces surrounding the asterisk, the order of const in this case is simply a matter of style. This chapter uses a prefix const, as for historical reasons this seems to be more extended, but both are exactly equivalent. The merits of each style are still intensely debated on the internet. As pointed earlier, string literals are arrays containing null-terminated character sequences. In earlier sections, string literals have been used to be directly inserted into cout, to initialize strings and to initialize arrays of characters. Note that here foo is a pointer and contains the value 1702, and not 'h', nor "hello", although 1702 indeed is the address of both of these. With the value of each variable represented inside its corresponding cell, and their respective addresses in memory represented by the value under them. The void type of pointer is a special type of pointer. In C++, void represents the absence of type. Therefore, void pointers are pointers that point to a value that has no type (and thus also an undetermined length and undetermined dereferencing properties). This gives void pointers a great flexibility, by being able to point to any data type, from an integer value or a float to a string of characters. In exchange, they have a great limitation: the data pointed to by them cannot be directly dereferenced (which is logical, since we have no type to dereference to), and for that reason, any address in a void pointer needs to be transformed into some other pointer type that points to a concrete data type before being dereferenced. sizeof is an operator integrated in the C++ language that returns the size in bytes of its argument. For non-dynamic data types, this value is a constant. Therefore, for example, sizeof(char) is 1, because char has always a size of one byte. Neither p nor q point to addresses known to contain a value, but none of the above statements causes an error. In C++, pointers are allowed to take any address value, no matter whether there actually is something at that address or not. What can cause an error is to dereference such a pointer (i.e., actually accessing the value they point to). Accessing such a pointer causes undefined behavior, ranging from an error during runtime to accessing some random value. NULL is defined in several headers of the standard library, and is defined as an alias of some null pointer constant value (such as 0 or nullptr). Do not confuse null pointers with void pointers! A null pointer is a value that any pointer can take to represent that it is pointing to "nowhere", while a void pointer is a type of pointer that can point to somewhere without a specific type. One refers to the value stored in the pointer, and the other to the type of data it points to.